Virtualization refers to the creation of virtual machines that acts like real computers with an operating system. Software executed on these virtual machines is separated from the underlying hardware resources. This article discusses LXC, a lightweight virtualization technology built into Linux kernel. The user space LXC tool is distributed with a number of templates that allow the creation of different Linux distro filesystems, usually one template for each major Linux distribution. The problem with these templates is they never work, or they stop working with every new release of LXC tool or of the particular Linux distribution. This is the case with all Linux distributions, and Debian is no exception. Currently, the Debian template is borken under “wheezy”. The relevant Debian bug is here, and history shows that as soon such a bug gets fixed, lxc user space driver changes again and breaks it. It could be worse, in Fedora LXC was broken in Fedora 15 and it was never fixed. The simple way to handle the problem is to forget all about the template mechanism and roll your own containers. In Debian you can build the container filesystem using the standard debootstrap, or mount read-only the host filesystem, and then use lxc-execute to start a simple bash session inside the container. In this session you can than start all the programs you need to run in the container. It is an application container, very similar to the containers created using the official ssh template distributed with LXC. The virtual machine I will describe in this article uses a root filesystem build using debootstrap (apt-get install debootstrap). The procedure is simple and it should work on any Debian machine. It will probably work also on any other distro based on Debian, such as Ubuntu, Mint etc. This entry was posted in Linux, Networking, Virtualization and tagged Debian, Firewall, LXC on November 3, 2013 by netblue30. Virtualization allows the creation of multiple virtual machines (VM) on top of an existing computer, each VM configured in a very specific way. All virtual machines run in parallel alongside the regular host applications, without affecting the host system. The type of virtualization I am currently using is Linux containers (LXC), a lightweight virtualization technology built into Linux kernel. This is my third Debian virtualization article. In the first article, I’ve described the steps to create and run a basic virtual machine using LXC. 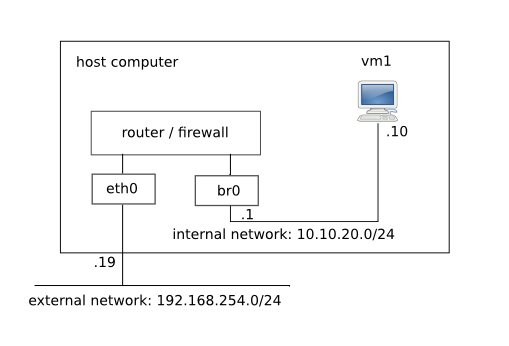 In the second article I’ve isolated the VM on its own network segment, with its own TCP/IP networking stack. Both articles were dealing with server VMs, I’ve used Lighttpd as an example throughout my articles. I will describe now how to run desktop applications such as Mozilla Firefox and LibreOffice in a virtual machine. I will use virtenv to build and run the VM. virtenv is a QT4 application released under GPLv2 license. It is basically a configuration wizard that allows you to configure and start the LXC-based virtual machines. Once the VM is started, you get a regular controlling terminal (xterm) and a desktop window running the lightweight Openbox window manager. In this window you can run your GUI applications, very similar to VMware Workstation or Oracle’s VirtualBox. 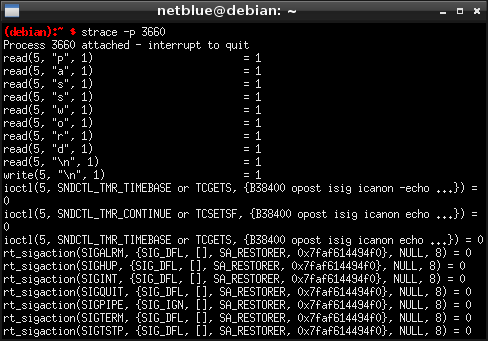 This entry was posted in Linux, Networking, Virtualization and tagged Debian, LXC on September 5, 2013 by netblue30.